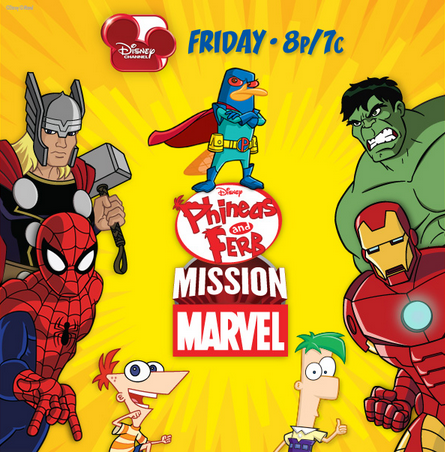 Catch "Phineas and Ferb: Mission Marvel" TONIGHT, August 16 at 8/7c on Disney Channel! In "Phineas and Ferb: Mission Marvel," Spider-Man, Iron Man, Thor and Hulk enter Danville after Dr. Doofenshmirtz's latest "inator" scheme accidentally removes their powers and immobilizes them. Now it's up to Phineas and Ferb to team up with the Marvel super heroes to help them regain their powers and defeat Marvel super villains Red Skull, Whiplash, Venom and M.O.D.O.K., who are working together with Dr. Doofenshmirtz to use his power-draining technology to create mayhem. Check out the Disney Channel website for Misson Marvel games! Phineas & Ferb - Super Perry & The Marvel Alliance - Help Agent P defeat the Marvel Villains with help from the Marvel Super Heroes. Phineas and Ferb - Mission Marvel Photo Mashup - Create your own superhero scenes with the Phineas and Ferb Mission Marvel Mashup!